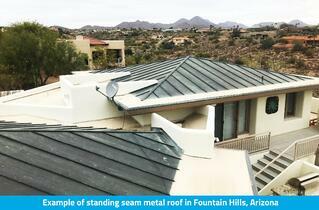 Metal roofs in Arizona require very little maintenance. Metal roofs will last upwards of 50 years! There are many different types of metal roofing options available for Arizona residents, such as standing seam, corrugated, stone coated, and painted, which allows you to select a metal roof that replicates the visual aesthetic of tile, shingles, slate, or wood shakes. All metal roofing is considered "Cool Roofs" by the US Environmental Protection Agency. This is because metal roofing can be painted any color, including colors on the lighter end of the spectrum, which will prevent solar heat gain. Because of the vast weather changes in Arizona, metal roofing has become quite popular depending on price point and location for Arizona residents. Metal roofing is wind resistant. Strong winds during a Phoenix sandstorm or monsoon season will not be able to blow metal roofing off your roof. 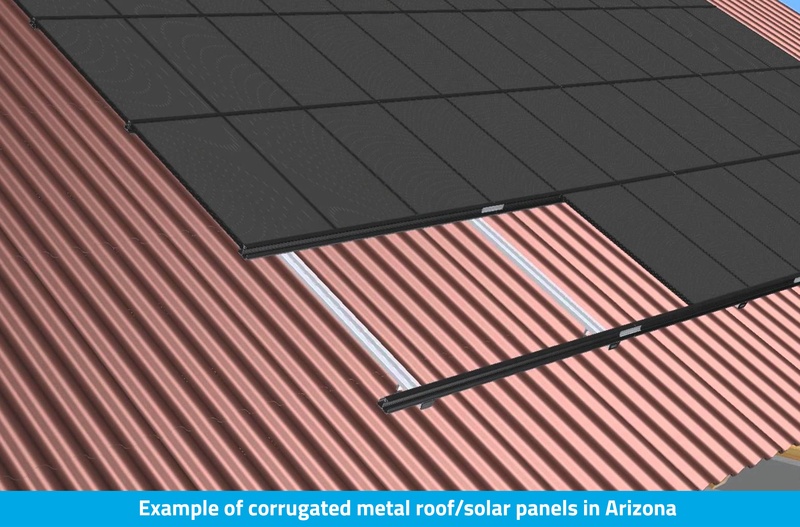 As mentioned earlier, metal roofing reflects solar heat. The result is not only a cooler attic and house, but also much lower cooling costs and tons of energy savings over time. This is especially true during the extreme heat the summer months bring to Arizona. Metal roofs are also fire proof. In fact, much like tile, they have a class A fire rating. Even when struck by lightning, a metal roof will not go up in flames. Metal roofs let snow and rain run off efficiently. Metal roofs are sleek, hard surfaces and thus rain and snow (which is not much of a consideration in Phoenix) can shed off with ease. If snow is a factor, as it can be in Northern Arizona, like Flagstaff, it's useful to know that shedding snow will not compromise the integrity of the roof and cause collapsing of the structure. Speaking of structure, metal roofs are lightweight in comparison to most other roofing materials, which also means that in terms of structural soundness, you most likely will have nothing to worry about. However, metal can dent. If a hail storm comes through Arizona, chances are your metal roof will experience denting. Metal roofs are also susceptible to expansion and contraction due to Arizona temperature changes. A standing seam metal roof can greatly improve the overall look, value, and energy efficiency of your home. Continuous panels run from the ridge of the roof all the way down to the eaves. Between the panels are seams connected by fasteners, which are raised above the level of the metal roofing. Modern corrugated metal panels offer superior corrosion-resistance, energy efficiency, and can provide an economical roofing and cladding solution for commercial, agricultural, industrial, and residential uses. Corrugated metal panels are usually made from thin-gauge steel, usually a 29 or 26 gauge steel, which makes it economical and practical when it comes to covering large areas of roofing surfaces. Corrugated metal roofs are more practical and longer lasting than asphalt shingle roofs and they cost much less than standing seam metal roofs or metal shingles. In commercial, agricultural, industrial, and some residential metal roof and metal wall panel applications, corrugated metal panels are often a roofing system of choice in Arizona based on two important factors: they are rather inexpensive, fairly long-lasting, and energy efficient roofing and metal siding alternatives for residential and commercial building envelope applications.